产品介绍： Powerful Cisco IOS® Software-based router for small to medium sites offers flexible connectivity options and simplifies large-scale wireless WAN deployments.Product OverviewThe Cisco® 800M Series Integrated Services Router (ISR) is a modular platform in the Cisco 800 Series ISR product family. Intended for small to medium sites, it provides a flexible array of WAN connectivity options with easy migration among WAN interface types. It runs Cisco IOS® Software and delivers built-in security in a single software image with no additional software licenses required. It also integrates application hosting capabilities right in the router.The Cisco 800M ISR is best suited for the following uses:● Secure WAN connectivity for branches● Transmitting transactional data from ATM machines, point-of-sale terminals, and kiosks● Cellular backup to primary wired links● Quick, easy connectivity in countries where most WAN infrastructure is cellular: 3G connectivity can be used for primary connections, backup connections, or both● Locations with WAN services requiring serial connectivity● Deployments requiring real-time, local data collection and analysis from vending machines, Internet of Things (IoT) devices, and M2M sensors in other applicationsThere are two Cisco 800M Series ISR models; the part numbers are C841M-4X and C841M-8X. Both integrate a Gigabit Ethernet switch and redundant Gigabit Ethernet WAN uplinks. Figure 1 shows the ISR 800M router with part number C841M-8X.Figure 1. Cisco 800M ISR (C841M-8X)The Cisco 800M Series platform supports pluggable Cisco WAN Interface Modules (WIMs) for flexible connectivity.Figure 2 shows the rear of the ISR 800M (C841M-8X) with WIM-3G and WIM-1T modules inserted. Figure 3 shows the rear of the ISR 800M (C841M-4X), also with both modules inserted.Figure 2. Cisco 800M ISR (C841M-8X) with WIM-3G and WIM-1TFigure 3. 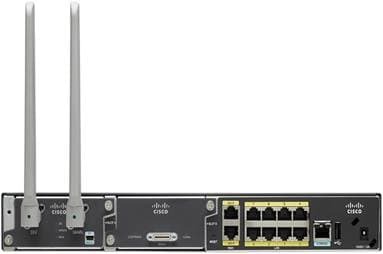 Cisco 800M ISR (C841M-4X) with WIM-3G and WIM-1TFeatures and BenefitsThe Cisco 800M Series ISR integrates enterprise-class security and application services while delivering the best price/performance ratio in its class. The router supports highly available and redundant WAN connection options and lets you easily migrate to different WAN connections for investment protection.The Cisco 800M ISR is the first in the industry to support multiple 3G technologies on the same pluggable WAN interface (the Cisco WIM-3G), providing you with the ability to choose the service provider. The platform is future-enabled, and it provides an open, extensible environment for developing and hosting applications at the network edge for local processing right in the router. The routers support single-pane-of-glass management and the 3G cellular Simple Network Management Protocol (SNMP) MIB.Table 1 details the features and benefits of the Cisco 800M Routers.Table 1. Features and Benefits of Cisco 800M RoutersRequirementCisco 800M Supporting Feature(s)Secure connectivity● VPNs: Integrated IPsec, Group Encrypted Transport, Cisco Dynamic Multipoint VPN (DMVPN), Cisco FlexVPN, Cisco EasyVPN● Integrated Cisco IOS Zone-Based Firewall with Next-Generation Network-Based Application Recognition (NBAR2)● Integrated domain/URL filtering● Cisco Cloud Web Security Connector for cloud-based web securityAbility to easily migrate to other WAN interfaces● Modular architecture that supports pluggable Cisco WAN Interface Modules (WIMs)Flexible choices of wireless WAN services and providers● Supports HSPA+/HSPA and EV-DO on a single multimode 3G WIM with fallback to 2G cellular technologies● Dual Subscriber Identity Module (SIM) and Removable User Identity Module (R-UIM) support for easy swap-out as you change networks and providersHigh network availability for business continuity● Supports two slots on a single 3G module that can hold a mix of SIM and/or R-UIM cards for cellular multihoming across HSPA+/HSPA and EV-DO WWANs● Dual Gigabit Ethernet WAN ports and support for two serial modules for primary/backup wired connections or a mix of wired and cellular links for redundancyConvergence of required capabilities into a single box for lower CapEx and OpEx● Integrates Gigabit Ethernet switch, routing, multilayer security, full Cisco IOS Software suite, multiple WAN interface choicesComprehensive and centralized network management● Integrated device management using Cisco Configuration Professional Express. Includes comprehensive Security Policy Management (covering identity, user, and user group domain filtering, VPNs, and cloud-based Cisco Web Security) with monitoring and reporting● Enterprise-class centralized provisioning and management using Cisco Prime™ Infrastructure● Remote management and network monitoring using SNMP (including 3G SNMP MIBs), Telnet, and HTTP, and locally through a console portLicensingThe Cisco 800M Series ISR default license supports the Cisco IOS Software Advanced IP Services feature set with no additional technology package license requirement (Table 2).Table 2. License for Cisco 800M Series ISRModelImageDefault Feature LicenseFirst Cisco IOS Software ReleaseCisco 800M ISRc800m-universalk9-mzSL-800M-AIS(Advanced IP Services)15.5(1)T1Table 3 lists Cisco IOS Software high-level features on the Cisco 800M Series ISR.Table 3. Cisco IOS Software High-level Features on Cisco 800M Series ISR: Advanced IP Services (Default)FeatureDescriptionIP and IP services● Routing Protocols: RIPv1, RIPv2, OSPF, EIGRP, BGP● Generic routing encapsulation (GRE) and multipoint GRE (mGRE)● Cisco Express Forwarding● Standard 802.1d Spanning Tree Protocol● Layer 2 Tunneling Protocol (L2TP, L2TPv3)● Network Address Translation (NAT)● Dynamic Host Configuration Protocol (DHCP) server, relay, and client● Dynamic Domain Name System (DNS), DNS Proxy, DNS Spoofing● Access control lists (ACLs)● IPv4 and IPv6 Multicast● Performance Routing (PfR)● Virtual Route Forwarding (VRF) Lite● Next Hop Resolution Protocol (NHRP)● Bidirectional Forwarding Detection (BFD)● Web Cache Communication Protocol (WCCP)● Flexible NetFlow (FNF)◦ PPP◦ HDLC◦ PPPoELAN● 16 802.1Q VLANs● MAC filtering● Switched Port Analyzer (SPAN)● Storm Control● Internet Group Management Protocol Version 3 (IGMPv3) snooping● 802.1xSecurity● IPsec with IKEv1& IKEv2, IPsec over IPV6, VRF-aware IPsec● EasyVPN, DMVPN, Tunnel-less Group Encrypted Transport VPN, Secure Socket Layer (SSL) VPN● Hardware-accelerated DES, 3DES, AES 128, AES 192, and AES 256● Public-key-infrastructure (PKI) support● Cisco Easy VPN Client and Server● Cisco IOS Firewall: Zone-Based Stateful Firewall, Application Aware Stateful Firewall with NBAR2 integration & VRF-Aware Firewall● Advanced application inspection and control● Secure HTTP (HTTPS), FTP, and Telnet Authentication Proxy● Cisco Web Security Connector● Intrusion Prevention (*1-GB DRAM minimum)● Tested for typical branch scenarios withup to 20 tunnels with minimum of 512-M DRAM and up to 100 tunnels with minimum of 1-GB DRAMQoS● Low-Latency Queuing (LLQ)● Weighted Fair Queuing (WFQ), Class-Based WFQ (CBWFQ)● Class-Based Traffic Shaping (CBTS) and Policing (CBTP)● Policy-Based Routing (PBR)● Class-Based QoS MIB● Class of service (CoS)-to-differentiated services code point (DSCP) mapping● Class-Based Weighted Random Early Detection (CBWRED)● Network-Based Application Recognition (NBAR), NBAR2● Link fragmentation and interleaving (LFI)● Resource Reservation Protocol (RSVP)● Real-Time Transport Protocol (RTP) header compression (cRTP)● Differentiated Services (DiffServ)● QoS preclassify and prefragmentation● HQoSHigh Availability● Virtual Router Redundancy Protocol (VRRP) (RFC 2338)● HSRP● MHSRP Application VisibilityNBARv2 and Performance Agent WAN OptimizationWAAS Express(*1-GB DRAM minimum)IPv6● IPv6 addressing architecture● IPv6 name resolution● IPv6 statistics● IPv6 translation: Transport packets between IPv6-only and IPv4-only endpoints (NAT-PT)● Internet Control Message Protocol Version 6 (ICMPv6)● IPv6 DHCP● OSPFv3● BGP4+● IPv6 path maximum transmission unit (PMTU)● IPv6 Neighbor Discovery● IPv6 stateless address autoconfiguration (SLAAC)● IPv6 Multicast RoutingManagement● Cisco Configuration Professional Express● Cisco Prime™ Infrastructure● Cisco IP Service-Level Agreement (IP SLA)● Cisco IOS Embedded Event Manager (EEM)● Telnet, Simple Network Management Protocol Version 3 (SNMPv3), Secure Shell (SSH) Protocol, command-line interface (CLI), and HTTP management● RADIUS and TACACS+Product SpecificationsTable 4 contains product specifications for the Cisco 800M Series ISR platforms.Table 4. System Specifications for Cisco 800M RoutersFeatureC841M-4XC841M-8XDimensions (H x W x D)1.72 x 13.5 x 6.9 in.1.72 x 13.5 x 6.9 in.Weight (kg) with blank modules1.7 kg1.7 kgWeight (kg) with both modules loaded2.5 kg2.5 kgRack-/Wall-MountableYesYesMemory (DDR3 DRAM): Default/maximum512 MB/512 MB1 GB/1 GBFlash memory (internal): Default/maximum2 GB/2 GB2 GB/2 GBExternal USB flash-memory slots (Type A)11Serial console port (up to 115.2 kbps)11Power supplyExternal AC power supplyExternal AC power supplyRedundant-power-supply supportNoNoAC input voltage100-240V ~100-240V ~AC input frequency50-60 Hz50-60 HzRJ-45 onboard LAN 10/100/1000 ports48RJ-45 onboard WAN 10/100/1000 ports22WAN Interface Slots22WAN Interface Modules3G CellularCisco Smart Serial Interface3G CellularCisco Smart Serial InterfaceIntegrated/Fixed WAN Connections2 Gigabit Ethernet2 Gigabit EthernetOutdoor AntennasYesYesDiversity (Dual Antennas)YesYesTNC Connectors for Field-replaceableOptional High-gain AntennasYesYesIntegrated/Fixed LAN Connections4 Gigabit Ethernet8 Gigabit EthernetEnvironmental Operating Range● Nonoperating temperature: -40 to 158°F (-40 to 70°C)● Nonoperating humidity: 5 to 95% RH● Nonoperating altitude: 0 to 15,000 ft(0 to 4570m)● Operating temperature: 32 to 104°F (0 to 40°C)● Operating humidity: 10 to 85% RH● Operating altitude: 0 to 10,000 ft (0 to 3000m)● Nonoperating temperature: -40 to 158°F(-40 to 70°C)● Nonoperating humidity: 5 to 95% RH● Nonoperating altitude: 0 to 15,000 ft (0 to 4570m)● Operating temperature: 32 to 104°F (0 to 40°C)● Operating humidity: 10 to 85% RH● Operating altitude: 0 to 10,000 ft (0 to 3000m)Approvals and ComplianceSafety:● IEC 60950-1:2005 (Second Edition); Am1:2009 + Am2:2013● EN60950-1:2006 + A1:2010 + A11:2009 + A12:2011 + A2:2013 ITE equipment● UL 60950-1+ AMD 1 AMD 2 ITE equipmentSafety:● IEC 60950-1:2005 (Second Edition); Am1:2009 + Am2:2013● EN60950-1:2006 + A1:2010 + A11:2009 + A12:2011 + A2:2013 ITE equipment● UL 60950-1+ AMD 1 AMD 2 ITE equipmentEMCEMC● EN55022 Class B● EN55024● EN61000-3-2● EN61000-3-3● VCCI Class B● 47 CFR Part 15● EN 300 386 v1.6.1● EN 301 489-1● EN 301 489-7● EN 301 489-24● EN55022 Class B● EN55024● EN61000-3-2● EN61000-3-3● VCCI Class B● 47 CFR Part 15● EN 300 386 v1.6.1● EN 301 489-1● EN 301 489-7● EN 301 489-24Radio:● EN 301 511● EN 301 908-1● EN 301 908-2● 47 CFR PART 22● 47 CFR PART 24Radio:● EN 301 511● EN 301 908-1● EN 301 908-2● 47 CFR PART 22● 47 CFR PART 24Ordering InformationThe Cisco 800M ISR default license supports the Cisco IOS Software Advanced IP Services feature set with no additional technology package license requirement. For ordering details, please consult the part numbers in Table 5. To place an order, visit the Cisco Ordering Home Page. To download software, visit the Cisco Software Center.Table 5. OrderingPart NumberProduct DescriptionC841M-4XCisco 800M ISR with 4 10/100/1000 LAN ports LAN, 2 10/100/1000 WAN ports onboard and two WAN Interface SlotsC841M-8XCisco 800M ISR with 8 10/100/1000 LAN ports LAN, 2 10/100/1000 WAN ports onboard and two WAN Interface SlotsWIM-1TCisco 800M ISR 1-port Serial WAN Interface ModuleWIM-3GCisco 800M ISR Dual SIM-multimode 3G WAN Interface ModuleACS-800M-RM-19Rack-mount/Wall-mount Kit for Cisco 800M ISR RouterWIM-BLANKBlank plates for Modular SlotsWarrantyThe Cisco 800M Series ISR comes with the Cisco one-year limited hardware warranty. Adding a contract for a technical service offering such as Cisco SMARTnet® Service provides benefits not available with warranty, including access to OS updates, Cisco.com online resources, and Cisco Technical Assistance Center (TAC) support services. Table 6 shows the available technical services.For information about Cisco warranties, visit http://www.cisco.com/go/warranty.Technical Service OptionsTable 6. Cisco Technical Services for the Cisco 800M Series ISRServiceDescription and FeaturesCisco SMARTnet Service● Next-business-day, 8 x 5 x 4, 24 x 7 x 4, and 24 x 7 x 2 advance hardware replacement1 and onsite parts replacement and installation available● Global access to the Cisco TAC 24 hours a day● Unrestricted access to the extensive Cisco.com resources, communities, and tools● Ongoing operating system software updates2 within the licensed feature set● Proactive diagnostics and real-time alerts on Smart Call Home-enabled devicesCisco SMART Foundation Service● Next-business-day advance hardware replacement as available● Business-hours access to SMB Cisco TAC (access levels vary by region)● Access to Cisco.com SMB knowledge base● Online technical resources through Smart Foundation Portal● Operating system software bug fixes and patches1Advance hardware replacement is available in various service-level combinations. For example, 8 x 5 x Next business day (NBD) indicates that shipment will be initiated during the standard 8-hour business day, 5 days a week (the generally accepted business days within the relevant region), with NBD delivery. Where NBD is not available, same-day shipment is provided. Restrictions apply; please review the appropriate service descriptions for details.2Cisco operating system updates include maintenance releases, minor updates, and major updates within the licensed feature set.For more information about Cisco Technical Services, visit http://www.cisco.com/go/ts. 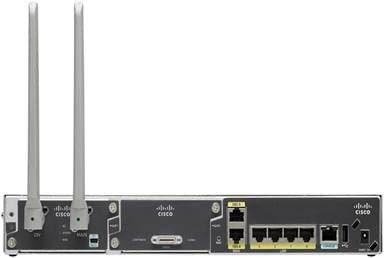 The Cisco® 800M Series Integrated Services Router (ISR) is a modular platform in the Cisco 800 Series ISR product family. Intended for small to medium sites, it provides a flexible array of WAN connectivity options with easy migration among WAN interface types. It runs Cisco IOS® Software and delivers built-in security in a single software image with no additional software licenses required. It also integrates application hosting capabilities right in the router. There are two Cisco 800M Series ISR models; the part numbers are C841M-4X and C841M-8X. Both integrate a Gigabit Ethernet switch and redundant Gigabit Ethernet WAN uplinks. Figure 1 shows the ISR 800M router with part number C841M-8X. The Cisco 800M Series platform supports pluggable Cisco WAN Interface Modules (WIMs) for flexible connectivity. Figure 2 shows the rear of the ISR 800M (C841M-8X) with WIM-3G and WIM-1T modules inserted. Figure 3 shows the rear of the ISR 800M (C841M-4X), also with both modules inserted. The Cisco 800M Series ISR integrates enterprise-class security and application services while delivering the best price/performance ratio in its class. The router supports highly available and redundant WAN connection options and lets you easily migrate to different WAN connections for investment protection. The Cisco 800M ISR is the first in the industry to support multiple 3G technologies on the same pluggable WAN interface (the Cisco WIM-3G), providing you with the ability to choose the service provider. The platform is future-enabled, and it provides an open, extensible environment for developing and hosting applications at the network edge for local processing right in the router. The routers support single-pane-of-glass management and the 3G cellular Simple Network Management Protocol (SNMP) MIB. Table 1 details the features and benefits of the Cisco 800M Routers. The Cisco 800M Series ISR default license supports the Cisco IOS Software Advanced IP Services feature set with no additional technology package license requirement (Table 2). Table 3 lists Cisco IOS Software high-level features on the Cisco 800M Series ISR. Table 4 contains product specifications for the Cisco 800M Series ISR platforms. 1.72 x 13.5 x 6.9 in. The Cisco 800M ISR default license supports the Cisco IOS Software Advanced IP Services feature set with no additional technology package license requirement. For ordering details, please consult the part numbers in Table 5. To place an order, visit the Cisco Ordering Home Page. To download software, visit the Cisco Software Center. The Cisco 800M Series ISR comes with the Cisco one-year limited hardware warranty. Adding a contract for a technical service offering such as Cisco SMARTnet® Service provides benefits not available with warranty, including access to OS updates, Cisco.com online resources, and Cisco Technical Assistance Center (TAC) support services. Table 6 shows the available technical services. For information about Cisco warranties, visit http://www.cisco.com/go/warranty. 1Advance hardware replacement is available in various service-level combinations. For example, 8 x 5 x Next business day (NBD) indicates that shipment will be initiated during the standard 8-hour business day, 5 days a week (the generally accepted business days within the relevant region), with NBD delivery. Where NBD is not available, same-day shipment is provided. Restrictions apply; please review the appropriate service descriptions for details.2Cisco operating system updates include maintenance releases, minor updates, and major updates within the licensed feature set. For more information about Cisco Technical Services, visit http://www.cisco.com/go/ts.